Groundbreaking innovations on Barratt London’s innovative Hendon Waterside Housing Development include Sustain-a-Bale, which is resulting in dramatic reductions in the volume and cost of waste. The Hendon Waterside regeneration project was established to deliver over 2,000 new homes and local amenities on a thirty-acre site in West Hendon, within the London Borough of Barnet. Part of the regeneration project involved the construction of The Vista – a 26 story flagship development made up of 142 apartments. To assist with the delivery of The Vista, market-leading residential developer, Barratt London, issued an appeal for new industry innovations that could help to minimise on-site waste. Any new innovations would need to be sympathetic to the location of the development site, which had limited ground-level space and access. In July 2015 Reconomy approached Barratt London and offered to install its newly-developed Sustain-a-bale system as an alternative to using skips and containers for the disposal of light mixed waste. Sustain-a-bale works by compacting low density materials in order to minimise the amount of space that these frequently bulky, yet lightweight, waste streams occupy – often reducing volumes by as much as 50%. The Sustain-a-bale system went live in November 2015 following agreement from Barratt London that it would be used to compact all packaging, insulation, card, polythene and carpet waste. Its objective was to ensure that the lowest possible volume of light mixed waste left the site each week. To oversee the management of the system, Reconomy took the unprecedented step of deploying its own full-time labourer on-site. Not only did this ensure Sustain-a-bale reached its full potential, it also removed the burden of responsibility from the site manager and Barratt London personnel. Despite initial meetings between Reconomy personnel and trade managers, it soon became apparent that waste was not arriving at the baling area properly segregated. Instead, light mixed waste was being mixed in with other waste streams that were supposed to be segregated at source, including metals, inert materials, wood and plasterboard. To overcome this, it was agreed that all on-site wheelie bins would be branded for use by specific trades, making it possible to identify who was responsible for the waste in each bin. This was supported by Barratt London’s management team who also informed all trades that any costs incurred by the cross-contamination of waste streams would be counter-charged back to them. Though Reconomy personnel were initially deployed to oversee the Sustain-a-bale baling process, our role quickly began to evolve. In addition to baling, our operatives were also checking wheelie bins for cross-contamination, providing advice to trades, ensuring metals, wood and other waste streams were correctly segregated, and helping to maximise skip utilisation by improving loading procedures. This enhanced role was formally acknowledged by Barratt London, resulting in the deployment of a Reconomy Site Waste Manager, with a specific remit of minimising on-site waste output. This freed up the Reconomy labourer, allowing them to focus on maximising output of the Sustain-a-bale system. In the two months prior to introducing Sustain-a-bale on-site, the Hendon Waterside project generated over 490 tonnes of light mixed waste alone, requiring 133 waste movements to remove it. In the five months following the introduction of Sustain-a-bale, which also coincided with the deployment of Reconomy personnel on-site, the amount of light mixed waste generated fell to 214.96 tonnes – an average of 42.99 tonnes per month. As a consequence on this, monthly waste costs also dropped considerably. 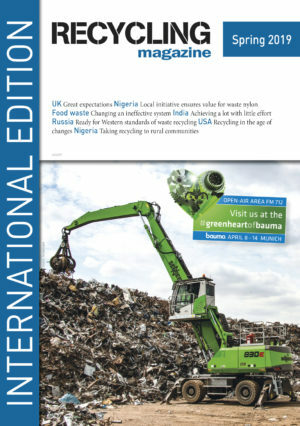 Because of the reduced volume, average monthly waste movements fell by over 45%. Across all of the project’s various waste streams, a total of 755 tonnes of waste was generated in the two months prior to the arrival of Reconomy personnel and the Sustain-a-bale system. In the five months that followed, the average amount of waste generated was 119.81 tonnes a month. At its lowest it fell to just 92.48 tonnes per month. Petcore Europe, the Brussels based association representing the complete PET value chain in Europe, welcomes eight new members in 2017: Hordijk, Sukano, Pellenc ST, M&G, SUEZ, Plastipak, Sidel and L’Oréal.